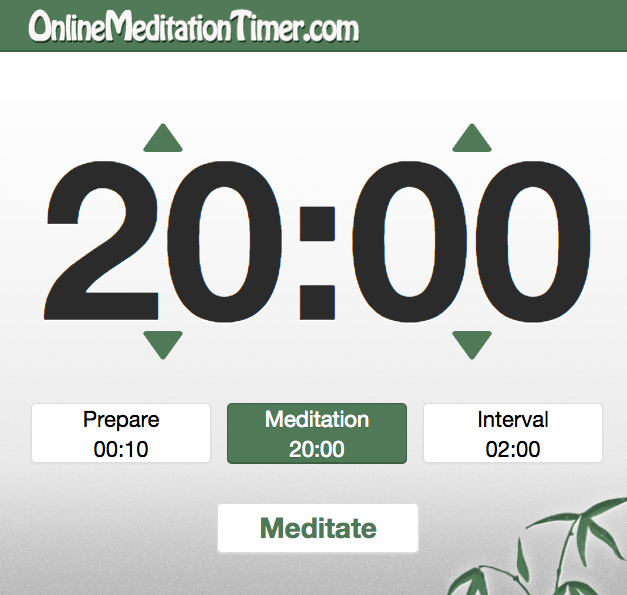 Screenshot from the Online Meditation Timer. This simple tool lets you set time intervals with a gentle sound that reminds you to move on to the next activity. Today I tried something new. I stumbled upon the (free) Online Meditation Timer and used it to pace myself while reading and responding to ten pieces of student writing that I was trying to finish within a prep period today at school. The assignment was a 350-500 word reflection on the film Lady Bird. (NOTE: For this assignment, I was grading holistically, focusing on my narrative response to the writer, and not completing a rubric. I wanted to spend no more than two minutes on each piece. I set the timer for 20 minutes, used the 2-minute interval setting, and clicked "Meditate." Of course, this tool is intended for meditation, but I found adapting for my grading purposes pretty easy. While reading and responding in Canvas, I would hear the timer chime to mark the end of one meditation segment (or for me, one writing assignment) and the beginning of the next. I often would finish grading before the timer chimed, and I bet the imminence of the chime increased my reading and writing speed. I occasionally tabbed over to see the remaining seconds in the segment and often found that I was beating my two-minute goal with an average time of 90-100 seconds. Twenty minutes later, I had read, scored, and responded in narrative form to ten students. It worked. The calmness of the chimes (sounding like a deftly tapped metal gong) helped me keep a pace without feeling stressed. With my tendency to be distracted by the infinite nature of the Internet (and my currently open 23 browser tabs), I think this little trick will help me focus and stay honest while grading.